We wanted to go to Greece for the day. We bought ferry tickets at 8am for the Greek island of Samos, which is just a short trip away from Kusadasi, where we are staying. By 8:15, we were next in line for Turkish passport control when we were told that the ferry had engine problems and the day's trip was cancelled. We spent the day in Kusadasi; at the market, relaxing around town, and walking to a quiet beach outside of town. 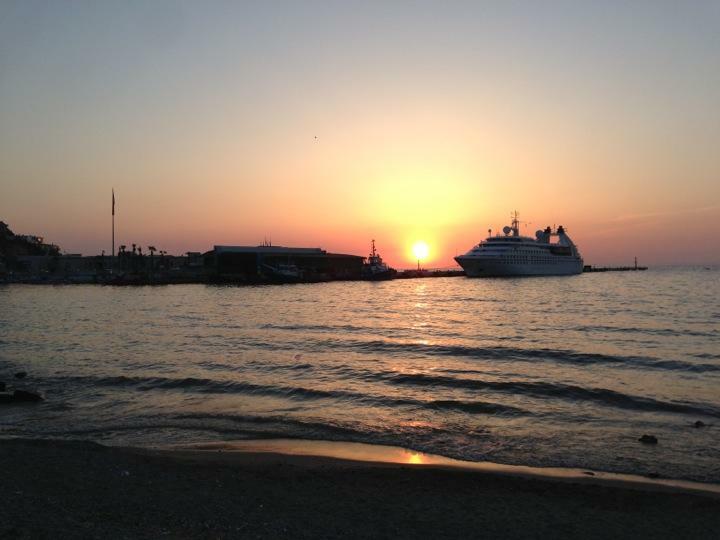 This is a picture of the sunset in Kusadasi of a ship that we didn't take.